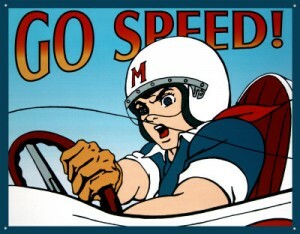 Go speed racer go, something many of us experience in our own lives each and every day. Frankly, I would much rather throw together a quick salad or slap a sandwich together versus taking the time to prepare more of a home-cooked meal after being at work all day. When reading a magazine that just arrived in the mail, I like to flip through the pages [back to front] glance at the pictures, skim over article headlines and outtakes. Hell this is America, we are all in an F'g hurry, with to-do list a mile long and demands for our time pulling us six ways from Sunday. Good grief, Charlie Brown get out of the way. But hey, even Speed Racer needs to take a pit-stop now. So to we as wine-tasters and writers sometimes being in a hurry need to slow-down, speed is not always a recipe for accuracy. It has been said, "There's three sides of every story, there's one side, the other and the truth" and I think that is true with this story. The story of Speed Tasting casualties is like anything else, there is always a grain of truth, but finding that grain is not always so easy to define. Why? Because you've voices on one side; decrying the unfairness of the speed-tasting, especially to some wines that are a bit reticent in showing their wonderfulness until they had more time out of the bottle. Then there are still other voices proclaiming that this method is unfair to the folks behind the label, okay I don't disagree. I have even I've heard some folks behind the label voice their displeasure over the speed-tasting part of the program. Truly, I do feel for them especially if this is their only chance to make a good impression, considering the price they have to pay to be part of the program. Still other voices questioning whether keeping the event as part of the line-up for future conferences is still a worth-while concept. That while once novel in the beginning is now tired and needing to be tweaked or thrown out. Then there still others who believe that having 5 minutes with a wine during a speed-tasting, is plenty enough time to get a good read on the caliber of the juice in question and don't see a problem with the Speed Tasting setup. Let's get to it then and talk about the dreaded Speed-Tasting. I say "dreaded" because from what I've seen [on Twitter] is nearly nothing-but boat-loads of criticism and some whining about whether this part of the conference should be scrubbed or changed. So I wanted to add my two cents here, one because I undoubtedly will get a wee-bit of traffic [moment of honesty] and two because while I could spend all that energy elsewhere, I think a blog is best forum for having the discussion. The Wine Bloggers Conference in Virginia presented me with the third occasion to participate in two rounds of Speed Tasting [similar to speed-dating] one for red and one for white. The folks pouring have about five minutes to pour and tell the tasters a bit about the wine. Tasters have those same five minutes to evaluate the wine, tweet about it, write a note and discuss with the folks pouring the wine. Tasters have a first impression and that is about all. Some wines really show well right from the first pour, but that doesn't mean they were the best. To me it means that some wines are just faster out of the blocks than other. Other wines, frankly need more time to showcase how wonderful they could be, but in this type of environment they don't have that opportunity. Here's my take away: I don't think there was any real right or wrong with the speed-tasting. I enjoy the speed-tasting portion of the conference. For me it's often a good way to see the wines up-close that I may not see again and it helps broaden my perspective. If there were no speed-tasting I may not have not come came across the Montefalco Sagrantino [which showed rather fabulously in the white and red speed tasting categories]. I do believe however that it would be helpful for consumers to understand the context in which the wine being reviewed was encountered. That said; the speed-tasting could use some tweaking. What kind of tweaking? From my perspective, the event could be changed for the better by allowing tasters to have more quality time with each of the wines encountered during the speed tasting. Here's what I suggest for next years even; instead of scrubbing it completely, just modify or tweak it a bit. My recommendation; immediately following the speed tasting it would be smart to have those same wines in lobby outside the conference room doors, with a small recommended food pairing and provide something beyond basic libby-style hotel stemware, give the wines a better chance show off. For the folks pouring especially the red wines, if you know that your wine is a bit shy right out of the bottle, that it opens up after it has had a bit of air on it, then bring in the decanter and the empty bottle with you [or at the very least bottle shots we could access on your site]. This story is case in point; a very tasty bottle of Pinot Noir that would have been a speed-tasting casualty, because I would not had given this wine another look based on my "first" impression from the speed tasting. The 2007 Talisman Red Dog Vineyard, Pommard Clone Pinot Noir did not show well during the tasting, but fortunately a bottle of it made its way back to San Diego. I had a chance to sit down with this wine and watch it unfold. Again after the first pour, sniff and slurp, I thought hmmm not much here. 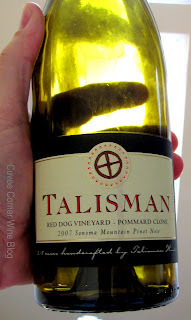 But as time went by, during dinner with some pan-seared mushrooms, risotto and wild caught sock-eye, the Talisman [from Sonoma] really kicked it into gear. A very complex wine, with layer after layer of tight raspberry, strawberry and baked cherry flavors laid over supple sandalwood and a silky long finish. A home run hitter for sure, this wine just didn't have the right place in line-up. It sells for a SRP of $46 and was received as a media-sample for the review process. I highly recommend you give it a swirl, watch it do its razzle-dazzle followed by some razzmatazz. Until next time sip long and prosper cheers!